Four contemporary photographers -- hailing from Yemen, Iran, Lebanon and Saudi Arabia -- are bringing a female perspective on the Middle East to the white walls of New York's gallery world. For the first time in NYC, these four women will showcase their stunning and provocative portraits of non-Western identities in a group show titled "The Middle East Revealed," shining a light on moments as traditionally significant as the Hajj and mundanely beautiful as a quite minute of reflection in a girl's bedroom. 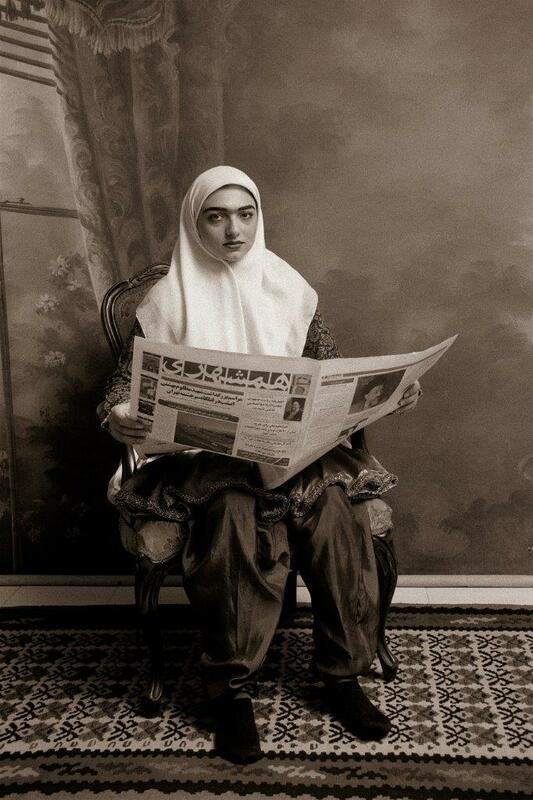 Boushra Almutawakel, Shadi Ghadirian, Rania Matar and Reem Al Faisal are photographers of the late 20th and early 21st centuries, famous in different corners of the Middle East for capturing diverse features of everyday life. While one uses the camera to venture behind the scenes of a young woman's sanctuary, another sets her lens on the architecture of Mecca. The shifting subjects and settings offer various perspectives on the nations wedged in Western Asia. Reem Al Faisal is known to some as the granddaughter of the late Saudi King Faisal. But since 1994, she's been a fixture in the photography realm, exhibiting her black-and-white snapshots of the hordes who make the pilgrimage to the birthplace of Muhammad. Dubbed "The Outspoken Princess" by Khaleej Times, she defines herself as "a Muslim artist, sprung from my native Saudi culture and history." Shadi Ghadirian, on the other hand, is a child of the Iranian revolution. Born in 1974, she examines her own experience living under sharia, coming head to head with censorship and conflict. In her images on view, she poses family and friends in the style of old photographs, reconstructing classical 19th century vignettes with a touch of contemporary. For instance, one of her portraiture subjects can been seen operating a vacuum. 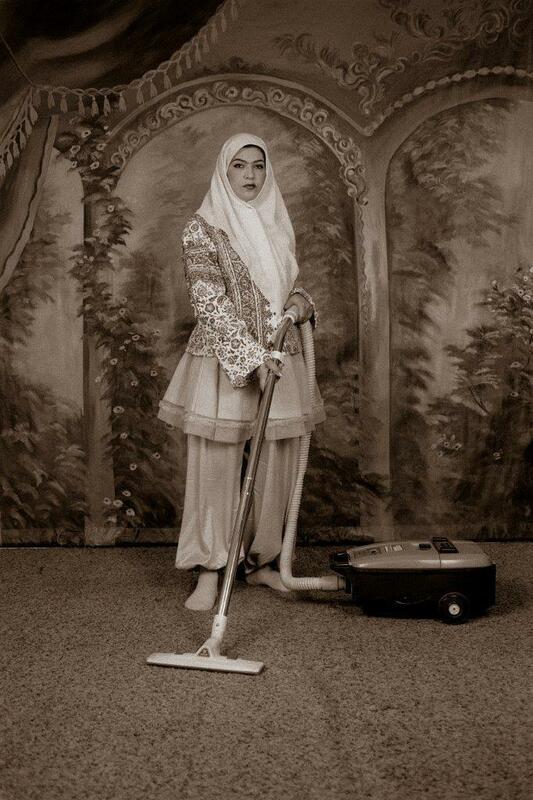 Boushra Almutawakel, who is considered to be Yemen's first female photographer, embarks on a similar juxtaposition. 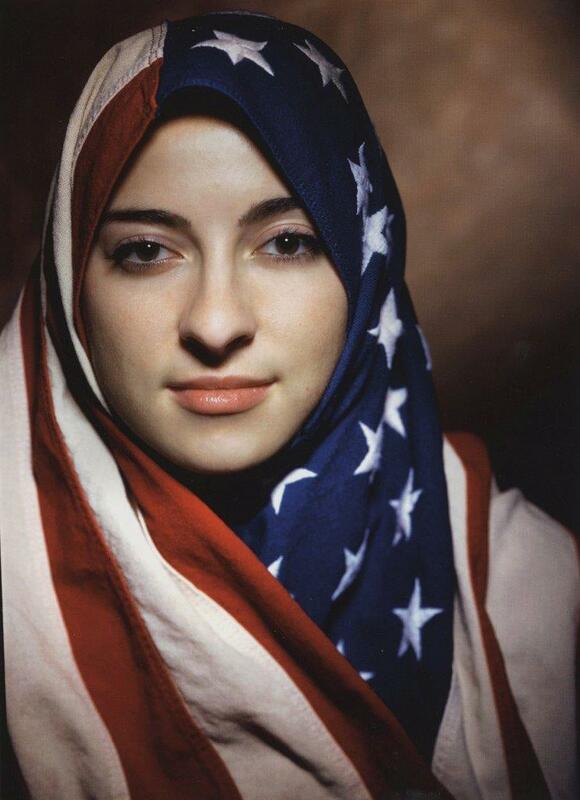 She positions women in veils directly in front of the camera, documenting their dominant postures and strong gazes. "I have photographed many other topics, but I do love photography related to women," Almutawakel explained to Project Inkblot. "I hope my work regarding women will generate curiosity, conversation, and debate, especially in the areas of social norms and stereotypes, and women’s rights. As women, we have sooo many issues to contend with, so many wrongs that need to be corrected, not just for women in the Middle East, but women everywhere." Rania Matar, born in Lebanon but based in the U.S. today, rounds out the group. Her photographs penetrate the personal spaces of adolescent girls, showing shots of teenagers in the States next to kids in the Middle East. The work of all four of these women will be topped off by a look back on the oeuvre of the American Margaret Bourke-White, the first female photojournalist who traveled to Syria to shed light on the country's internal politics before her death in 1971. "Bourke-White's pioneering work for Life magazine, featuring terrifying images of war, the concentration camp victims at Buchenwald, and Gandhi at his spinning wheel, established her place in the photographic pantheon," CNN's Bruce Kennedy wrote in 1999. Check out a preview of "The Middle East Revealed: A Female Perspective," on view at Howard Greenberg Gallery until August 30, 2014, and let us know your thoughts on the works in the comments. Margaret Bourke-White, Members of the native Bedouin camel cavalry, commanded by the French expeditionary force, posing on their she-camel mounts in desert near Damascus, Syria., 1940, Gelatin silver print; printed c.1940, 10 1/4 X 13 5/8 inches, Photographer's credit stamp, LIFE Picture Collection stamp, Time, Inc. reproduction stamp, and annotations in pencil and colored pencil on print verso. Margaret Bourke-White, A Columbia Pictures movie billboard for "The Spy in Black" starring Conad Veidt, also written in Arabic, in busy Ismailia sqaure, 1940, Gelatin silver print; printed c.1940, 8 1/4 X 11 1/2 inches, Date and annotations in pencil, "Publicity Censor" stamp, "Passed By Censor" stamp, and Time Inc. copyright stamp on print verso. CLARIFICATION: Margaret Bourke-White was an American photographer, regarded as the first female photojournalist, who traveled to Syria on assignment from LIFE in 1940, seven months before the United States entered World War I. The above text has been amended to better clarify this.